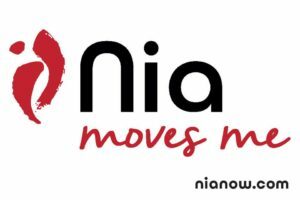 For me, Nia is “mindfulness poured into movement”– but there’s so much more to tell you! Nia encourages you to dance at your own pace, engage your senses, listen to your body, and to seek pleasure. Think “all pleasure-all gain” rather than the old “no pain-no gain! Nia empowers people of all shapes and sizes to discover, explore, unleash, and enhance their individual potential. What a loving concept! Each Nia class experience brings mindfulness to your dance movements and provides opportunities for you to feel energized, mentally clear, and emotionally balanced. And the music! Oh, so delightful! The Nia Technique was founded in 1983 by Debbie Rosas and Carlos AyaRosas in the San Francisco area. Classes and workshops are taught by licensed Nia teachers in over 50 countries worldwide.